They say you can use statistics to tell any story you want. Just make the numbers do what you need them to. We’ve all heard the lawmakers in favor of a public plan throw out a figure of 47 million uninsured in the United States. Well, if you really look at the calculations, that number shrinks to an actual number of 14.7-17.5 million uninsured. Want to know how they come up with that 47 million number? So if you look at the chart on the left, you’ll see that it starts with 47 million. Now, subtract out the 8.4 million that are eligible for Medicare/SCHIP but have not bothered to enroll in the program. Now, subtract out the 10.2 million people who are not U.S. citizens. Now, subtract out the 4.7 million college students who would rather spend their money on textbooks than health insurance. Now, subtract out the 9.2 million people who are in-between jobs and have not taken COBRA or are in their benefit waiting period. This also includes those people who have incomes higher than $75,000 who could buy insurance but chose not to those individuals who are in-between jobs and have not taken COBRA or are in their benefit waiting period. This includes the ultra-wealthy (think guys like Bill Gates) who can afford to pay out of pocket for anything they need. 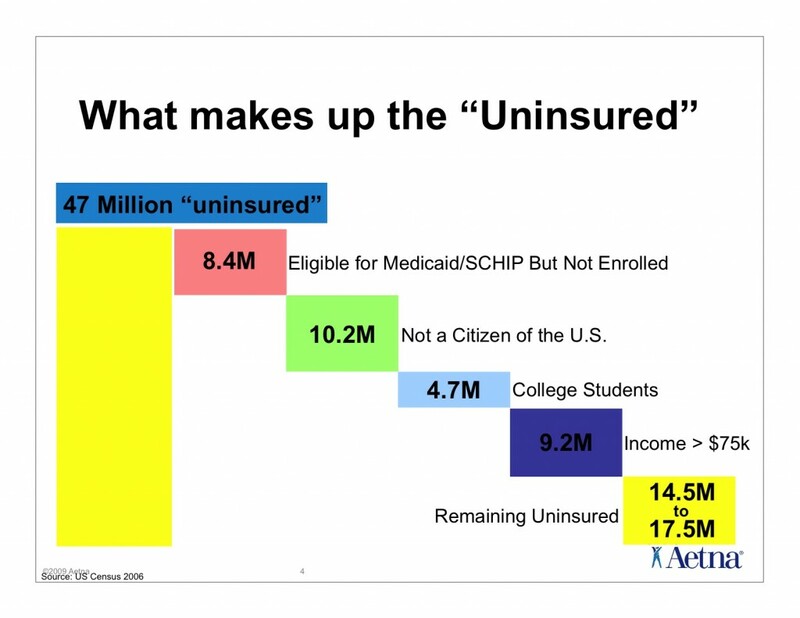 So, once you clear up the numbers, you are left with 14.5 to 17.5 million uninsured. This is only 5.7% of the current U.S. population of 304 million!